WOW! DO I HAVE A TREAT (IN MORE WAYS THAN ONE) FOR YOU TODAY! 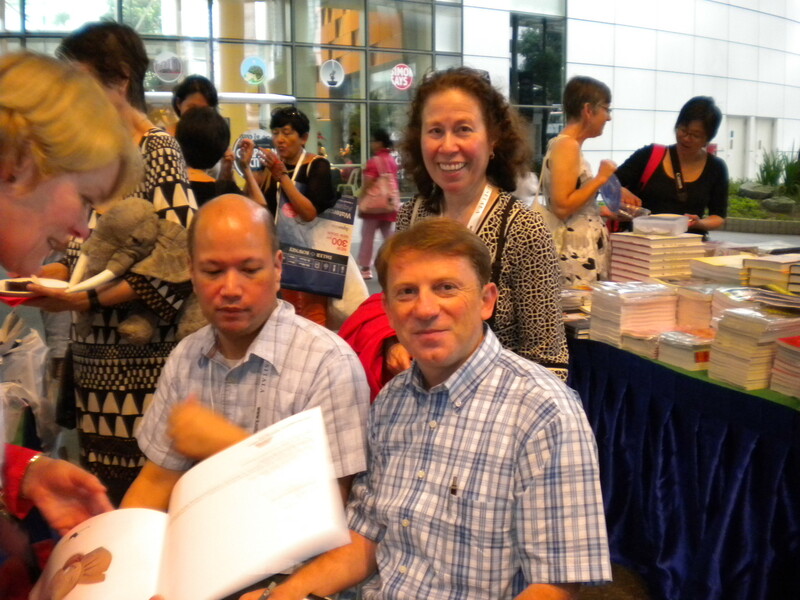 When I got the opportunity to travel half-way around the world to attend the 2013 Asian Festival of Children’s Content/SCBWI Conference, I was excited, and somewhat anxious. What would I find there? How would it be? Where would I stay? When would I ever get back? Who would I meet? Those questions were soon answered…all very positively. I found a beautiful country, with amazing facilities, an awesome hotel and had no problem getting back (although I didn’t want to leave). 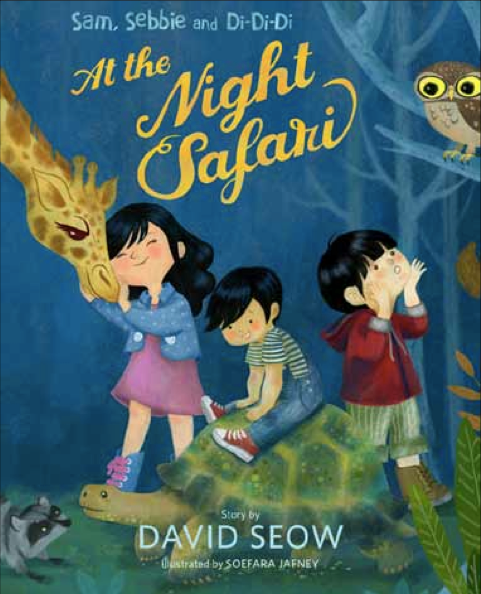 I met the most incredible people – and today, on WILL WRITE FOR COOKIES, I’m honored to introduce one of Singapore’s leading picture book authors, DAVID SEOW. That is David on the left and Enrico Sallustio, one of the illustrators he works with, on the right…and lucky me behind them). When I was little, my favorite authors were Eric Carle Jean de Brunhoff, Roald Dahl, Astrid Lindgren and Oscar Wilde. I wish I had known a lot more than I did when I first embarked on this crazy adventure in children’s publishing. 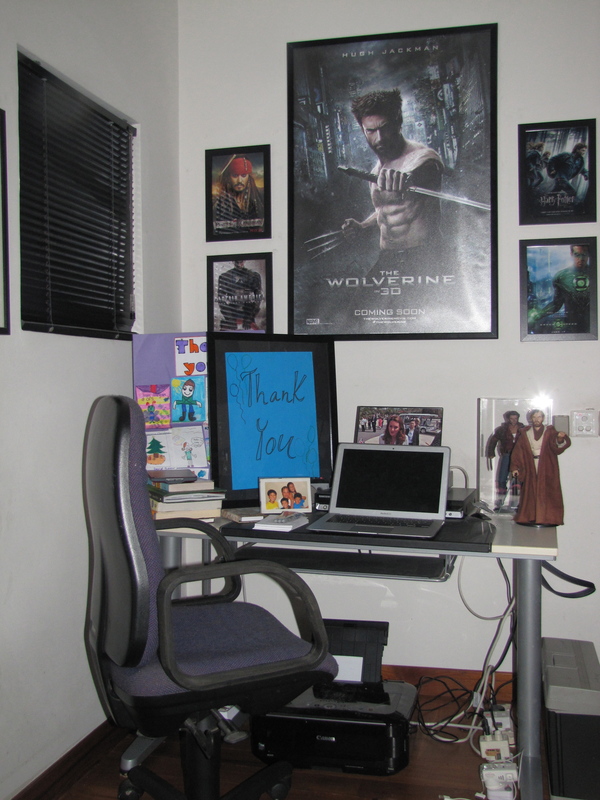 Like most first-time authors I was relatively idealistic about writing and publishing. I have to admit that it was a dream to have my first book published. After 15 years I’m a bit wiser and a lot less idealistic. It’s a tough industry and you’ve got to be prepared to handle disappointment and rejection on a regular basis. 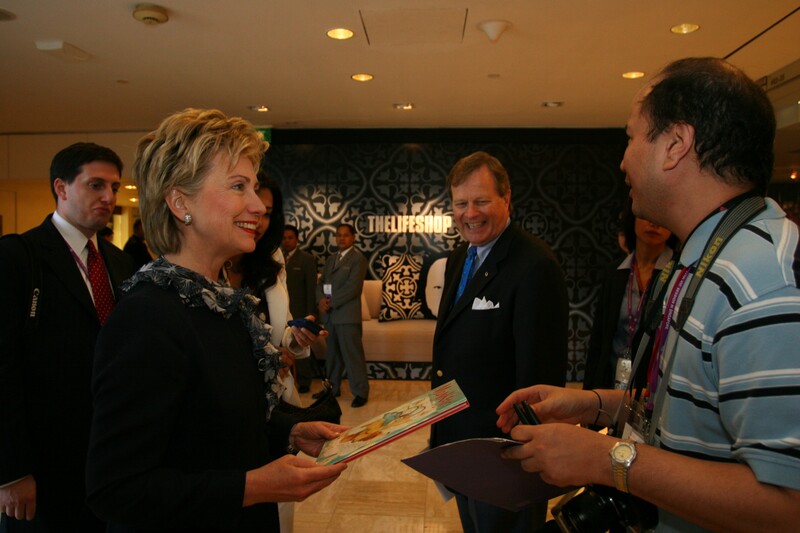 Yes, that’s right…Hillary Rodham Clinton speaking with David and holding one of his books! I usually go for a long walk before I start writing and I go back to my study and then I play some music and I start writing on my laptop. I’ve tried to write at the library and at Coffee Bean & Tea Leaf but I tend to get easily distracted if I go somewhere other than my study. I write at different times of the day. I’m not one of those writers who stick to a specific time of day. My imagination works on its own schedule and I can’t force it. When inspiration strikes, I write. HOW COOL IS THAT? THE DUCHESS OF CAMBRIDGE IS HOLDING HER COPY OF DAVID’S BLOW A KISS. I’ve always been a daydreamer and I have an extremely active imagination. People who don’t know me say I’m like a child; people who do know me say I AM a child! I guess it’s because I don’t feel like I’ve ever really grown-up! I like practical jokes, superhero movies, comics, and toys! Most of my adult friends think this is weird. Actually, I’m more comfortable relating to kids on their level than I am to most grown-ups. My theme song is Toys ‘R’ Us song: “I don’t want to grow up, I’m a Toys ‘R’ Us kid.” I’ve never been a confident person and I’ve always had low self-esteem. I guess the reason why I write children’s books is because I’m able to relate to their fears, hopes and dreams. David Seow is the author of several well-received children’s picture books including the ‘Sam, Sebbie and Di-Di-Di’ series. 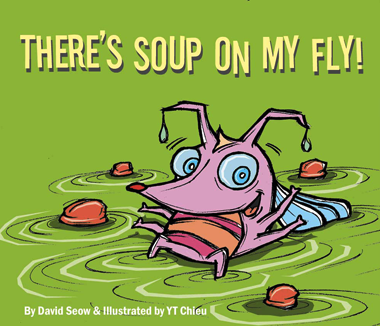 In 2011, his book ‘There’s Soup on My Fly!’ was shortlisted for The National Book Development Council of Singapore’s Hedwig Anuar Children’s Book Award. 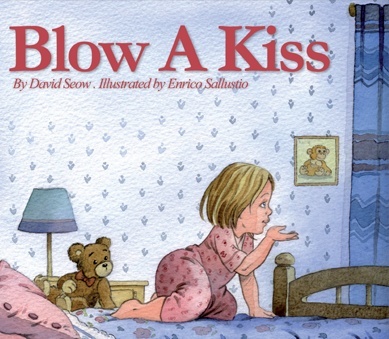 In 2012, ‘Blow a Kiss’ was selected as one of the top ten children’s picture books from Singapore at IFLA Congress in Helsinki and ‘There’s Soup on My Fly’ was dramatized at the Literature Lecture at the Asian Festival of Children’s Content. 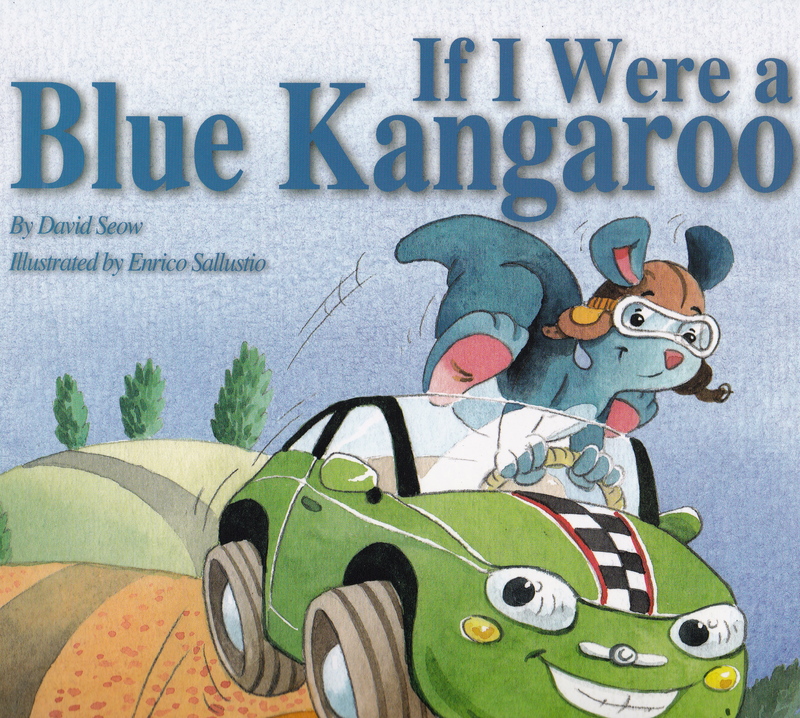 That same year, David’s 27th book ‘If I were a Blue Kangaroo’ was launched in 2011 and received favourable reviews. David, thank you so very much for participating…I’m excited to share the delicious fudge recipe you contributed. 1. Put sugar, butter and water into a large non-stick saucepan. 2. Stir gently until sugar is dissolved. 3. Add milk and bring to boil. 4. Simmer on very low heat until mixture thickens and browns; this could take 45 minutes. 5. Stir occasionally during simmering. 6. Remove from heat; cool slightly and beat well. 7. Pour into a 9x9x2 inch greased tray. 8. Wait until it is set and cut into squares. YUM!!!! WASN’T THIS THE MOST FUN, VISITING WITH DAVID? Let’s put our hands together to thank David for stopping by. I hope you’ll take a moment to check out some of his links (the last link is AMAZING) and his wonderful books. You will be lucky if you can scoop a couple of them up. I’ve reviewed Emma’s Elephant and Blow a Kiss already for Perfect Picture Book Friday…and I’m looking forward to spotlighting a few more in the next several months. Next month, we’ll be visiting with another incredible Singaporean author, Emily Lim. I know her answers are going to be super helpful to aspiring AND published authors…and I’m excited to see what yummy treat she has in store for us. This entry was posted in children's author David Seow, Cookie and Fudge Recipes, Will Write for Cookies and tagged Asian Festival of Children's Content, Author/illustrator interview, children's author David Seow, Duchess of Cambridge, Hillary Rodham Clinton, National Book Development Council of Singapore, Princess Di Fudge recipe, Will Write for Cookies by viviankirkfield. Bookmark the permalink. Thanks you David for sharing your process and your work. (I’ll have to try the fudge recipe too! Yummy.). Thanks Vivian. How great you got to go there and meet him! I’ll have to get his books for my grandkids. Great interview of an interesting gentleman. Thanks for sharing! His books look great–thanks for sharing! He sounds like such a nice man (or should I say kid? 🙂 and his books look delightful. I look forward to checking them out. And the fudge..mmmmmm. Thanks Vivian! Yes, I think David would say he is very much a kid at heart. :) I think you will love his books, Iza. Among other things, Simon & Schuster is starting a Sci-Fi imprint and Penumbra Magazine wants Super Hero stories. And the Fog Horn is paying $1000 a story (for 1200-8500 words).